I'm running my first marathon on Sunday, May 1, in Cincinnati. The Flying Pig Marathon commences at 6:30am. If you are interested in tracking my progress via email or text, follow the link. Search for my name (I'm the only Ben Keller) and click how and when you want live updates. Thanks to all my family, friends, and students for supporting me on this amazing journey from a sedentary lifestyle to 26.2 miles! We would like for you to know of two exciting OSU School of Music events coming up in the next two weeks. The Contemporary Music Festival, April 28 and 29, honors Professor Emeritus, and former Dean of the College of the Arts, Donald Harris. The festival includes four world premieres, a performance by BalletMet Columbus, performances by OSU student ensembles, faculty and guest artists, including soprano, Lucy Shelton. The premiere of the documentary film, Sonata 1957, which traces the roots of a composition that Harris composed while studying in Paris, will be shown both nights at 7 p.m. And, a special display of Harris mementos – letters and photos of friends and teachers Nadia Boulonger, Ross Lee Finney, Aaron Copland, John Cage, Morton Gould, Robert Shaw, Gunther Shuller, and others - will also be on display. Visit cmf.osu.edu. HS Band and Choir – Ladies in all black, pants or long skirts, black shoes. Gentlemen wear black pants, socks, shoes, and a black long-sleeved collared dress shirt. We are contacting you to let you know about an exciting opportunity for your students to explore the musical opportunities at The Ohio State University. 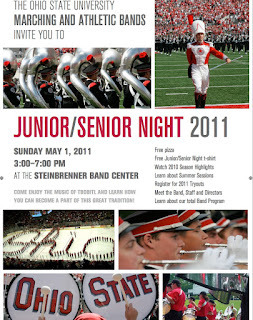 On Sunday, May 1st, we will host our annual Junior-Senior Night for interested students, parents and band directors. If your high school students are interested in learning more about the many musical opportunities they would have at Ohio State, please pass this information on to them. If you have received this information via the US Mail, please pardon the redundancy. I just wanted to let you all know about an opportunity presented to me by one of our band families. 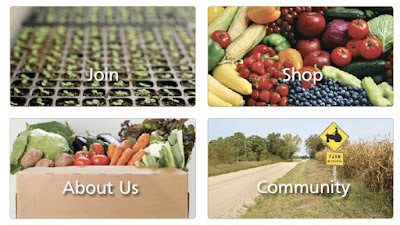 If you are interested in locally grown oganic produce, cheese, milk, and eggs then click the link and read about Isidore Foods. There is a local delivery pick up spot in Plain City (9139 Oak Ridge Ln. ), but if enough Marysville or even Fairbanks community people interested, more pick up points could be arranged. The web page has quite a bit of detailed information, but if you have questions contact them directly at info@isidorefoods.com. I also have several coupons in my office for 10% off your online order. They are first-come, first-serve. Just ask. Korg Wavedrum Mini makes music from your nervous tics (video): "
Do you have an interesting or unique talent and a desire to show it off? If so, The Marysville Art League/Houston House Arts Center will be holding auditions for talented individuals, duets, or groups to participate in a community talent extravaganza. All interested singers, dancers, jugglers, musicians, magicians, comedians, etc are welcome! Auditions will be held Tues., April 12, Wed., April 13 and Thurs., April 14 from 6-9 pm at the First Presbyterian Church "Upper Room Theatre" (third floor), located at 210 W. 5th St., Marysville, Oh, 43040. Please provide your own form of accompaniment for auditions. Production dates are tentatively scheduled for mid-May. For more information, contact Nebbie Brown at 937-243-3703 or nebbie@yahoo.com. Look forward to seeing you and feel free to forward to anyone you think would be interested! Thank you. Okay, FMB...What do you think about option two? This is another option for the 2011 contest show. Let me know what you think by commenting. Please leave your first name or initials if you would. Greetings to all and HAPPY SPRING! We are all looking forward to the nice temperatures returning. Just wanted to remind everyone that April 1, 2011 we all need to go to www.krogercommunityrewards.com and resign back up to help out the band for the coming year. 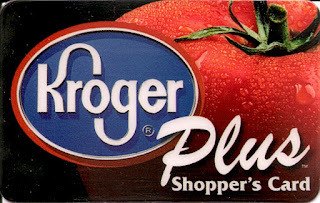 Kroger has changed its program so that we need to re-enroll every year. Now is your chance to help out the FMB and you don't have to take any extra money out of your pocket. Just sign up and 5% of what we spend a quarter comes back to the Fairbanks band and we spend it on our children! What better way to show your support. Thanks again and hope all are enjoying the week off! Marching Band season is in full swing as we get ready for our rookies and our veterans. We look forward to another great year!